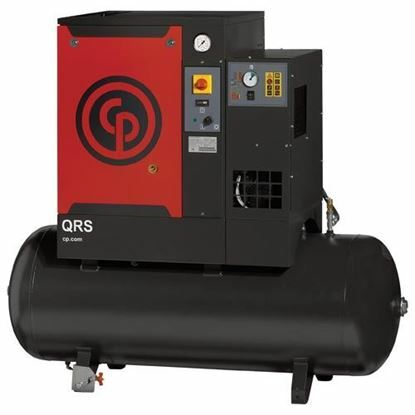 Engineered for high performance, efficiency and reliability, the Chicago Pneumatic line of QRS (Quiet Rotary Screw) air compressors can meet the compressed air demands of a tire shop, maintenance shop, vehicle body, paint shop or automotive dealership. Quiet by design, the QRS7.5 can be installed almost anywhere. With standard mounted receiver tank, the QRS is the leading rotary screw compressor for light industrial applications. The HPD in the part number signifies that the QRS7.5 comes complete with a high performance air compressor dryer. Purchasing an air compressor that comes complete with an air dryer is common practice, and one benefit to the Chicago Pneumatic QRS7.5 air compressor is that a dryer comes standard. The integrated dryer will help to reduces and helps to eliminate water and rust from accumulating in the tank, and also prevents water from flowing through the pipes and into the finished product.